Volunteer Ambassadors are needed to support the presence of the Second Harvest Food Bank of Central Florida during the 2019 Disney Wine & Dine Half Marathon Weekend at Walt Disney World Resort. In honor of this year’s Disney Wine & Dine Half Marathon Weekend, runDisney is thrilled to make an independent donation to Second Harvest Food Bank of Central Florida. Your registration and participation will not affect the amount donated. 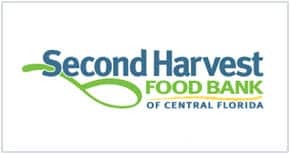 Second Harvest Food Bank of Central Florida is a powerful and efficient local hunger relief network that provides more than 52 million meals each year for struggling low-income families, children, seniors, homeless and others in need. The organization also helps transform lives and create financial stability by training people for careers in the culinary industry. Volunteer opportunities are available October 31 – November 3, 2019 for various events. Second Harvest Food Bank of Central Florida (SHFBCF) secures and distributes donated food and grocery items to approximately 550 local nonprofit feeding programs throughout Central Florida and is a member of Feeding America, the nation’s largest domestic hunger-relief organization. Thanks to help from food and financial donors, volunteers and a caring, committed network, the food bank distributed 52 million meals to partner programs such as food pantries, soup kitchens, women's shelters, senior centers, day care centers and Kids’ Cafes last year. The Central Florida community turns to Second Harvest's partner agencies more than 71,000 times per week. The Walt Disney World Wine & Dine Half Marathon helps create awareness of Second Harvest Food Bank of Central Florida and raise much-needed funds to support the growth of its mission. For every $1.00 contributed to Second Harvest, up to $9.00 worth of groceries can be distributed for people in need. To learn more about SHFBCF, visit www.FeedHopeNow.org. Volunteer Ambassadors are needed to support the presence of the Second Harvest Food Bank of Central Florida during the 2019 Disney Wine & Dine Half Marathon Weekend at Walt Disney World® Resort. In honor of this year’s Disney Wine & Dine Half Marathon Weekend, runDisney is thrilled to make an independent donation to Second Harvest Food Bank of Central Florida Your registration and participation will not affect the amount donated. Advent Health will be providing complete medical coverage for the 2019 Disney Wine & Dine Half Marathon Weekend. We invite you to be a part of the elite medical team that provides race support for 10,000+ runners. We need state certified/licensed MDs, DOs, PAs, DPMs, ARNPs, RNs, ATCs, PTs, PMs and EMTs to volunteer their time. Hours vary by day and assignment. You should be available as early as 3:00 AM and as late as 2:00 PM. You must also be able to stay for the duration of your assigned schedule. To request an application or for more information, please call our Medical Volunteer Hotline at (407) 303-4053. Print the waiver for ADULTS and complete it. Print the waiver for MINORS and have a parent or legal guardian complete it. For opportunities that take place during the Expo and Kids Races, please wear comfortable, neutral-colored, appropriate-length shorts or pants (khakis preferred but no jeans, yoga or athletic pants) and comfortable closed toe shoes (no sandals or flip flops). For opportunities that take place during the 5K, 10K and Half Marathon race, you may wear jeans (no holes or rips please) with comfortable closed toe shoes (no sandals or flip flops). All Volunteer Ambassadors must go through the bag check route—with or without bags. Volunteer Ambassador opportunities for the 2019 Disney Wine & Dine Half Marathon Weekend will be scheduled on a first-come, first-served basis. Schedules are always subject to change due to event needs. All Volunteer Ambassadors must sign a waiver to obtain credentials and participate. If you are picking up a credential for another volunteer, please print the waiver and have it signed in advance by the participant. Volunteers under 18 years of age must have a waiver signed by a parent/legal guardian. Volunteer Ambassadors who are scheduled for the 2019 Disney Wine & Dine Half Marathon Weekend (except Race Prep) must pick up their volunteer credentials at the ESPN Wide World of Sports Complex on one of the days listed below or the Disney Sports Building during the Early Bird Pick-Up date. Check back to find out when registration opens and then sign up to be a Volunteer Ambassador during the 2019 Disney Wine & Dine Half Marathon Weekend.